Demo releases are NOT demos! They are merely pre-alpha releases that allow you to see the game progress. Ele ira vingar a morte de sua esposa e mãe...você e capaz de ajudalo? Então jogue este joguinho levissimo para ver o resutado da 1ª parte e testar sua abilidade em jogos!!!! Nothing in this world is safe. Evade, dodge, avoid, and every other synonym of that word to win. There is no end to the barrage of... squares? 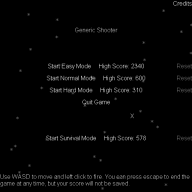 Possibly the most generic (yet addicting) bullet-hell shooter ever! This will be my 3rd major game project after I finish Oncoming Storm: Darkness Strike. I won't post too much of the plot in the description as it will spoil the game. Desenvolvedor: Tech Cube!®, ERM Games. A short platformer in which you play as a banana man in an attempt to rescue your home from a catchy, musical talent. Along the way, you will collect some bananas. There is next to no real story. Play the role as the hero that will risk his life to save his homeland from the evil Warlock! Cast spells, shoot arrows, and swing your sword in this addictive action RPG! 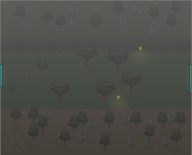 Beta Remake on Dawn of the Elements. Just a public "test" demo. I didn't want to delete the original, because that one is more complete.